Humans can communicate what is going on with them, and dogs can, too. The difference is, while humans primarily use verbal communication, dogs mainly communicate non-verbally through the use of body language and secondarily through vocalizations. This body language includes tail carriage and motion, ear and eye position, body position and movement, and facial expressions. Knowledge of body language, and the ability to accurately identify it, will help decipher what a dog is trying to communicate. When observing a dog’s body language to determine what is being communicated, it is crucial to observe the entire dog, as well as the situation/context, in order to accurately determine what is being conveyed. For example, a wagging tail does not necessarily mean a friendly dog. A moving tail, as a part of the dog’s body language that is readily identifiable, is often noticed first. However, if the dog’s body is stiff, the ears are back and the dog is in a crouching position, these other features of body language are telling you that this is not a happy dog. There are five common groups of canine communication signals. As you review the groups, please keep in mind that in a given situation a dog can demonstrate more than one of these groupings in response to the situation. For example, a dog may begin by displaying excitement signals in response to a stimulus, decide that stimulus is a threat, and switch to aggressive signals, fear signals, or even both. Also keep in mind that stress can drastically influence a dog’s response to a given situation. Again, we must look at the whole dog and his body language, as well as the situation/environment in order to get the “big” picture of what the dog is communicating, what may happen next, and what our appropriate responses should be. When a dog is frightened, he most likely will react to the fearful stimulus with his whole body. The body language may show up as a combination of several signals and/or may appear as a progression through these signals as the dog’s response intensifies. He may lick his lips (though he is not hungry) or yawn (though he is not tired). He may keep his mouth tightly closed. He may cower or lower his body, lower or tuck his tail, or put his ears back. He may also tremble or shake, look away to avoid eye contact, or lean back to avoid the stimulus that is perceived as frightening. Sometimes, the absence of active signals can communicate as much as the active signals. For example, a dog that is not eating food/treats, is avoiding people when they approach his kennel, or freezes when reached toward, appearing “shut down” is demonstrating fearful communication signals. Note: There is a potential for a fearful dog to switch to aggressive body language if the presence of the fearful stimulus continues, or becomes more threatening. Please click here to view the “Identifying Fearful Body Language in Dogs” poster. For more information on identifying and helping fearful dogs in shelters and rescues, please see our "Fear of People" Management Tool. 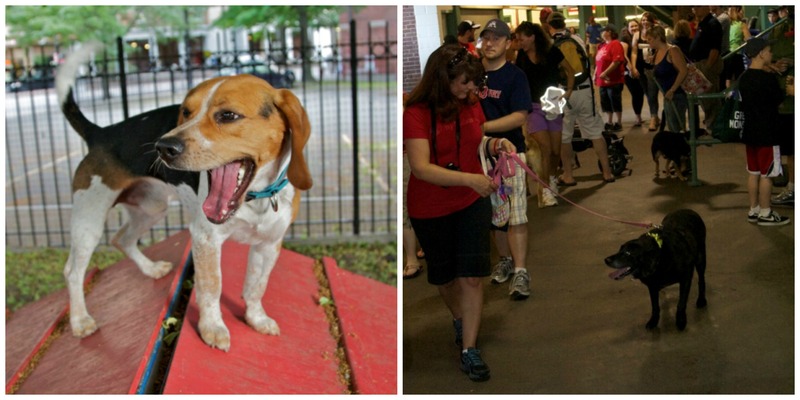 Often in shelters we observe dogs that demonstrate high arousal or excitement behaviors. The arousal or excitement can be due to many factors including age (adolescent dogs), confinement, lack of physical and mental outlets, and personality. Arousal/excitement is often a response to a stimulus the dog likes: such as a person, dog, or toy. For example, a dog with soft, relaxed body, eyes, mouth and a wagging tail that jumps up for your attention is a dog that is seeing a favorable stimulus (person). He may also play-bow: rear end in the air, front end lower if he is excited about a favorable stimulus (person or toy). However, arousal behaviors can also be due to unfavorable stimulus: such as an unwanted person, dog, or situation. Arousal signals in response to an unfavorable stimulus may be coupled with fear signals, such as trembling or a low/tucked tail. Arousal signals may also be paired with aggressive signals such as barking or lunging, or with anxious signals such as pacing or spinning. Some common behaviors observed in aroused/excited dogs are jumping, mounting, and mouthing. Mouthing can be soft (teeth contact but no pressure or pain) or hard (teeth contact causing pain and discomfort) or biting of leash or clothing. When a dog is aroused or excited, its fur can be pilo-erect (standing up), its ears are generally forward or at attention, and its body stance is upward and erect. The tail is often up and wagging stiffly, and the eyes are open wide and very focused. The dog may also be barking and/or lunging. For more information on identifying and helping excited/aroused dogs in shelters and rescues, please see our "Jumpy/Mouthy" Management Tool. The shelter environment can impact the level of stress a dog experiences. Dogs that are normally pretty relaxed can become anxious and dogs with minimal anxiety on intake can become progressively anxious. Body language of an anxious dog includes excessive panting, pacing, and lack of focus. An anxious dog may demonstrate similar body language to a fearful dog. He may pant excessively (when not hot or recently exercised), lick his lips (when not hungry), yawn (when not tired), and have a slightly lowered body stance with his ears slightly back. He may wag his tail slowly and look away or move away from people. He may also shed and drool heavily. Anxious dogs, similar to fearful dogs, may exhibit the absence of behaviors and appear “shut down”. Alternatively, an anxious dog can possibly demonstrate arousal/excitement behaviors while in the shelter as a result of stress and anxiety. An anxious dog in a kennel could be barking, pacing, circling, or bounding off kennel walls. An anxious dog may also bark and lunge at dogs passing by its kennel. A dog that is jumping at the front of the kennel as a person approaches is displaying arousal/excitement communication signals. Whereas, a dog that is jumping off the side walls of the kennel with no person approaching is displaying anxious communication signals. Please click here to view the “Identifying Anxious Body Language in Dogs” poster. To view anxious behavior, please watch our videos of Mickey (jumping/bounding off kennel walls and spinning) and Maria (anxious barking, jumping and whining in kennel). For more information on identifying and helping anxious dogs in shelters and rescues, please see our blog post, Alleviating Stress in Shelter Dogs: A Case Study. Aggression is a normal and natural behavior in dogs, and animals in general. Often aggression is triggered by a perceived threat: such as a person, another dog, or inanimate object. Aggression is used by the dog to protect itself and its “possessions” from the aforementioned perceived threat. The dog uses aggressive communication signals to convey that it will defend itself, its territory, or its possessions. In many cases, aggressive body postures or vocalizations are warning signals and the dog’s behavior may never escalate into a bite. For example, if a dog is uncomfortable with a person approaching a rawhide he is chewing, he may stiffen, growl or show his teeth. At this point, if the person decides to continue and come closer, the dog could snap or bite, but he may not. In these cases, heeding the warning signals of the dog is the best way to prevent an escalation of aggressive behavior. As previously mentioned, aggressive signals may be paired with other signals, such as fearful ones. For example, if a dog is fearful of something and its fear signals have been misread or ignored, it may switch to aggressive signals as an escalated attempt at communication. Aggressive body language includes stiffening or freezing of the body, eyes wide with a lot of white showing (whale eye), tense mouth or curled lips, wrinkled nose, showing teeth, barking, growling, and air snapping. Please click here to view the “Identifying Aggressive Body Language in Dogs” poster. For more information on identifying and helping possessive aggression in dogs in shelters and rescues, please see the Food Aggression Management Tool. We all love to see dogs in a relaxed position. A relaxed dog appears not to have a care in the world. His mouth is relaxed and slightly open with ends that could be turning up (almost appears to be smiling). His head and ears are in a neutral position. His body is loose and eyes are soft. His tail may be wagging in a swishing back and forth, or even circular motion. He often will be lying down, sometimes even in the “frog-leg” position (now that’s a relaxed dog!). Please click here to view the “Identifying Relaxed Body Language in Dogs” poster. Learning to read body language, in order to respond appropriately, takes time, observation, and practice. Remember that a dog may display more than one group of signals in the same situation. By reading the whole dog, the whole situation, and the whole context we get a better grasp of what the dog is communicating, what may happen next, and what our response should be. Please refer also to our information on managing stress, providing enrichment, and modifying problem behaviors.